India on Friday stood its ground that its Air Force had shot down a Pakistani F-16 fighter jet, after a report in the US Foreign Policy magazine said all F-16 combat jets in Pakistan’s inventory had been accounted for. The US magazine report, published late on Thursday, cited two unidentified American defence officials and contradicted the account put out by India that one of its fighter jets, a refurbished Russian- made MiG-21 Bison, had downed a US-made F-16. The report said US personnel had done an inventory check of Pakistan’s F-16s and found none missing. The F-16s are manufactured by Lockheed Martin Corp. and an end-user agreement requires the buyer to allow for regular inspections to ensure they were accounted for, it said. Pakistan invited American officials to physically count the F-16 planes after the incident. Some of the aircraft were not immediately available for inspection because of the conflict, so it took several weeks to account for all of the jets, one of the unnamed officials quoted by the report said. 1. It is a well known fact that American arms majors Lockheed Martin and Boeing are in contention for two very distinctive and lucrative fighter jet deals with India's MoD for the supply of 114 single-engine fighters for the Air Force and 59 carrier borne fighter jets for the Navy. 2. "The US may be reluctant to admit an F-16 fighter jet was shot down by an obsolete warplane like the MiG-21 thus creating doubts among Indian policy makers about the veracity of the F-16s" said strategic analyst Brahma Chellaney of New Delhi-based think tank Centre for Policy Research, in a Twitter post. 3. Wing Commander Abhinandan had locked on his R-73 missile to the PAF F-16 and there is next to little chance for the F-16 to have survived a direct hit from a seasoned IAF fighter pilot. Wing Commander Varthaman provided “It’s not the size of the dog in the fight, it’s the size of the fight in the dog”. The man behind the machine matters a lot in a combat situation. Training was the key. The R-73 missile was the second factor. It is among the best in the world in close combat. R-73 is a proven and much feared weapon which is believed to have a spectacular kill rate. 4. Electronic signatures gathered by the IAF indicate that the PAF aircraft was downed by the IAF was an F-16. Unlike the Pakistani establishment IAF is not in the habit of resorting to blatant lying. 5. Though an end-user agreement exist between the US & Pakistan for regular inspection of assets sold to Pakistan, it is not not known if the US can exercise the same rights to fighter planes procured from third-party sources by Pakistan. 6. The Pakistan Air Force (PAF) purchased 13 F-16s from Jordan in April 2014. The newly arrived aircraft is being operated by 19 Squadron ‘Sherdils’, which was also officially re-formed at Mushaf Air Base as an F-16 unit. The Squadron had previously been a Chinese of F-7P/FT-7P Operational Conversion Unit at PAF Base. It was reported that the PAF had used the 'Sherdils' squadron for the operation against India. 7. 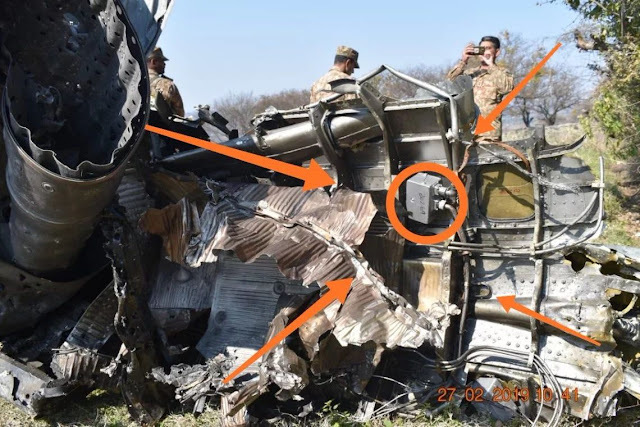 Amusingly, Pakistani armed personnel had inadvertently posted pictures of the downed F-16 soon after the dogfight on social media and the eagle eyed India media had picked this gaffe and published these photos soon after the failed PAF response. 8. A separate report had clearly proved the downed PAF F-16 was of Jordanian origin, the report traced the serial number of the fighter from an unclassified F-16 database source. 9. It is a veiled attempt by the powerful arms lobby in the US to discredit India's claims of downing an F-16 fighter by an obsolete Russian fighter. Moreover, the Russians have also been smiling on this development, they have been crying hoarse of the heroics of the 1950s designed MiG-21 soon after MEA announced of its F-16 kill. According to military observers, in the 51 years of the MiG’s existence, this is first time it had shot down an F-16. 10. So far, Lockheed Martin, the company that now owns the F-16, in conjunction with multiple production lines in Belgium, the Netherlands, Turkey, Japan and South Korea, has delivered 4,588 F-16s to 26 countries. A definitive F-16 kill by a MiG-21 fighter could be a marketing death knell for the ageing American fighter in the international market. 11. Finally, whatever despicable propaganda is being ranted and believed, Indian policy makers can find solace in the fact that it has been able to inflict several demoralising reverses to the Pakistani armed forces in the past couple of years. This is a diametrically opposite u-turn from the much bandied "Strategic Restraint" policy practised by previous governments. India’s accumulated rage and exasperation at Pakistan and its sponsorship of terrorism in Kashmir has finally exploded. The writing is very much on the wall for both the American companies, be it the F-16 "Fighting Falcons" which was never really in contention for the MMRCA deal nor the Boeing F/A-18 "Super Hornets" for the Indian Navy. The propaganda report by Foreign Policy magazine is nothing but a last ditch effort to salvage Lockheed Martin's impending F-16 business deals in the international market as it is going to be a challenge for the US government as well as the aircraft manufacturer to now market the F-16 globally as a viable modern fighter option.